One of the Western States of the United States of America; admitted into the Union in 1896. 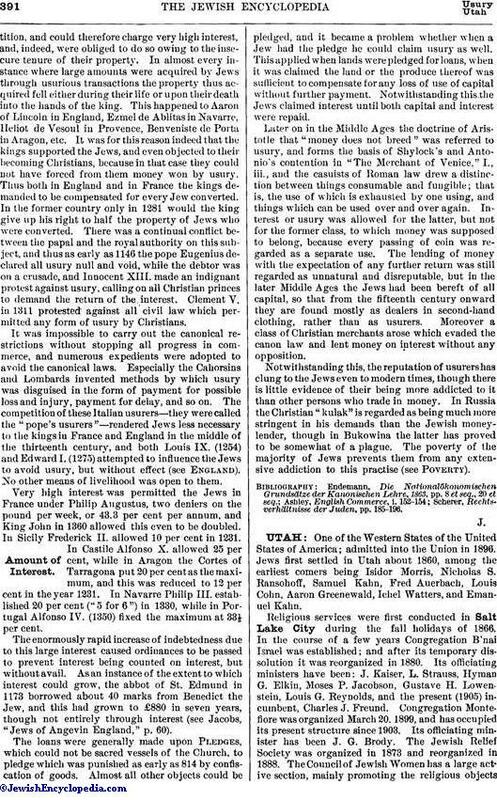 Jews first settled in Utah about 1860, among the earliest comers being Isidor Morris, Nicholas S. Ransohoff, Samuel Kahn, Fred Auerbach, Louis Cohn, Aaron Greenewald, Ichel Watters, and Emanuel Kahn. 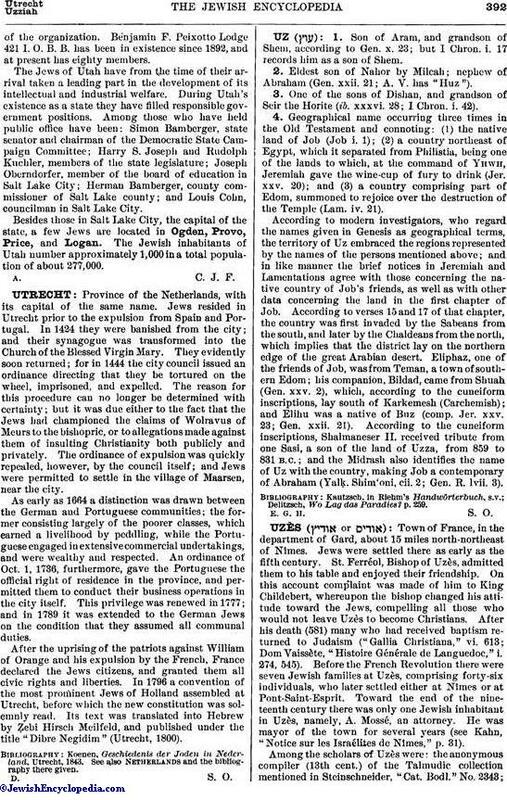 Religious services were first conducted in Salt Lake City during the fall holidays of 1866. In the course of a few years Congregation B'nai Israel was established; and after its temporary dissolution it was reorganized in 1880. Its officiating ministers have been: J. Kaiser, L. Strauss, Hyman G. Elkin, Moses P. Jacobson, Gustave H. Lowenstein, Louis G. Reynolds, and the present (1905) incumbent, Charles J. Freund. Congregation Montefiore was organized March 20, 1899, and has occupied its present structure since 1903. Its officiating minister has been J. G. Brody. The Jewish Relief Society was organized in 1873 and reorganized in 1888. The Council of Jewish Women has a large active section, mainly promoting the religious objectsof the organization. Benjamin F. Peixotto Lodge 421 I. O. B. B. has been in existence since 1892, and at present has eighty members. The Jews of Utah have from the time of their arrival taken a leading part in the development of its intellectual and industrial welfare. During Utah's existence as a state they have filled responsible government positions. Among those who have held public office have been: Simon Bamberger, state senator and chairman of the Democratic State Campaign Committee; Harry S. Joseph and Rudolph Kuchler, members of the state legislature; Joseph Oberndorfer, member of the board of education in Salt Lake City; Herman Bamberger, county commissioner of Salt Lake county; and Louis Cohn, councilman in Salt Lake City. Besides those in Salt Lake City, the capital of the state, a few Jews are located in Ogden, Provo, Price, and Logan. The Jewish inhabitants of Utah number approximately 1,000 in a total population of about 277,000.